We can see this is a permissions error. 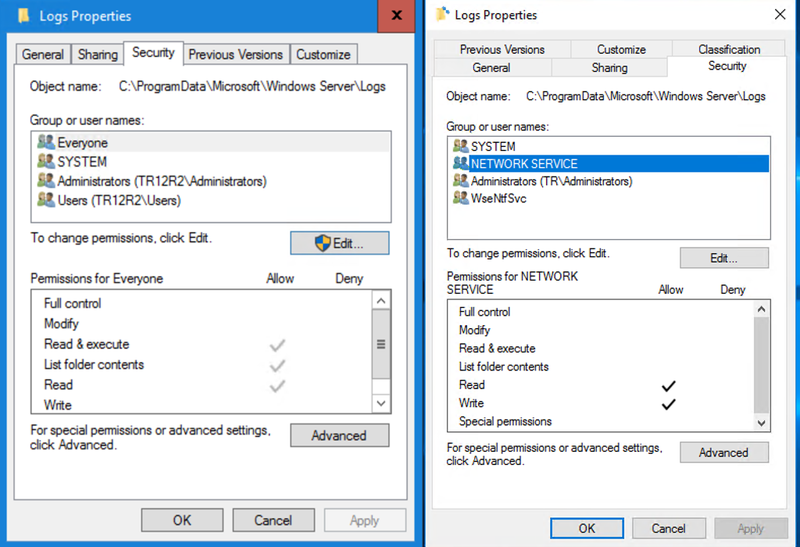 Comparing the permissions of the folder in question (c:\programData\Microsoft\Windows Server\Logs) with my upgraded version to a default install of 2016 Essentials we can see that ‘Network Service’ is allowed Read/Write permission on the folder, and the upgraded folder does not have this permission set. Adding those permissions in solves the issue and lets the page load as expected. However, we can also see that another entry on the default 2016 ACL is shown. WseNTfSvc which also has Read and Write to the Logs folder. The WseNTfSvc account seems to be a service account, but not one I can locate! I will attempt to update this post when I have some more info on what it is and what it is doing. Having asked some of the cleverest folks I know, I can now say that this WseNTfSvc is actually a Service, not a service account or a virtual account. I suppose the fact it has the letters Svc in the name should have been some clue. What it is used for is not clear yet, but at least we know what it is. 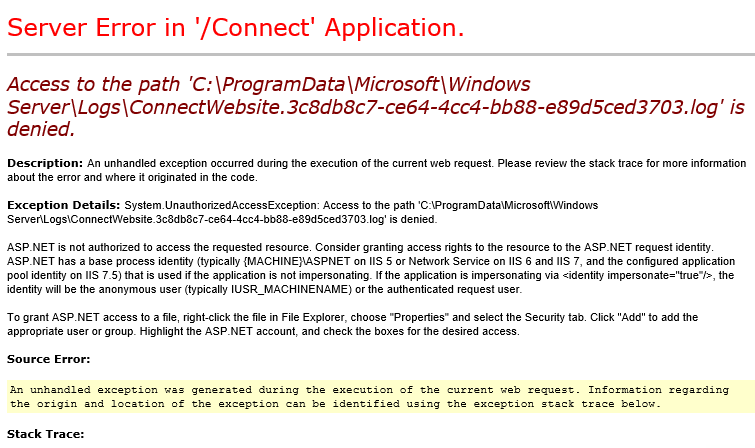 Is there an MS-supported in-place upgrade path from WSE12R2 to WSE16? I had just assumed it would need to be a clean install of new server OS. Thanks for sharing. I don’t know, it is not something i would do by choice, supported or not. Have you come across any issues with WSE Storage Service crashing while creating a folder through Dashboard. This is happening on WSE2016. Every time I create a folder through dashboard WSEStorage crashes, when the Folder Creation reaches 80% and when I try to restart the service – Access is Denied. 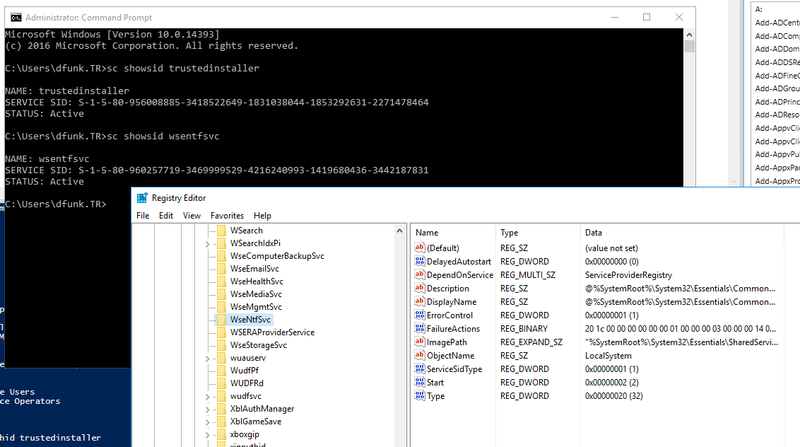 I Checked the version for ntdll.dll it is 10.0.14393.479, which seems to be the latest as per https://support.microsoft.com/en-us/help/4004227/windows-10-update-kb3206632. Let me know if you are able to recreate this issue or you have any suggestions. Yes I have seen this or similar, where dashboard reports the folders are missing, when they aren’t and crashes on move or recreate. It’s possible to do an in-place upgrade from WSE12R2 to WSE16? Possible, yes. Would I? No. Supported, not sure. Were you able to resolve that?